The 152-mm Gun / Launcher M551 Sheridan is a Rank VI American light tank with a battle rating of 8.3 (AB/RB/SB). The tank was added in Update 1.59 "Flaming Arrows". Against most opponents, the M551 can be destroyed with a single shot. It's best to just stay in one spot along a road and wait for an enemy to pass by where so that they present their vulnerable side armour and vitals to target at. Once the ATGMS are unlocked then the player can stay out of range from everything but ATGMs. Ammo racks of the M551 Sheridan. 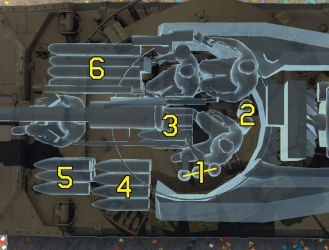 The Sheridan, even with the ability to fire ATGMS, is an extremely difficult tank to use due to it having no armour. Even some high-power MGs can penetrate the armour easily. The stock heat round while having high pen drops like a rock at range and bounces ALOT. Immediately upon reaching the tier 2 modifications research the ATGM missiles. Once those are unlocked the Sheridan becomes a fast and mobile missile platform that out ranges most vehicles in game. With only the stock HEAT always aim for ammo racks. This is pretty much the only way to destroy the heavier tanks. The mobile AAs will be the M551's biggest problems. 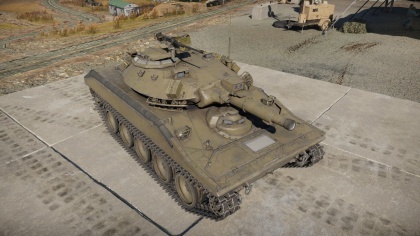 While the Sheridan can drive circles around most of its heavy opponents, the fast anti-air turret can keep up with the M551, able to tear the armour to pieces. The ATGMs are a vast improvement over the HEAT rounds, one shotting pretty much everything and extending the Sheridan range past that of most of its opponents. Stay in the back, everything will one shot the tank. Use the M551's speed and maneuverability to get around enemies. Don't be afraid to get in real close to the enemy, because with only HEAT, the 152 mm's effective range is very limited. Once ATGMs are usable, the Sheridan becomes an extremely formidable sniper. Able to fire on target, destroy a target, then move position for another opportunity. In Arcade, the Sheridan is an easy target for everyone, but in realistic and simulator its speed makes it a very hard target to hit. Dual-purpose cannon, firing regular shells or guided missiles. Missiles in RB have a point-to-aim guidance system. Rather small profile in comparison to other Rank V vehicles. Uses only chemical rounds, no kinetic rounds (AP) available. ATGM has a reload several seconds longer than normal ammunition. Can only hold 10 ATGM ammunition total. In the post-war period, U.S. Army specified for a new light tank that is light enough for air-transportation and have a large cruising range. The first resulting light tank, the M41 Walker Bulldog, did not meet these specifications and the following development such as the T92 were cancelled after the discovery of the amphibious Soviet PT-76 tank, which added a requirement for the light tank to also be amphibious. A new tank design began development, using aluminum alloy to save weight, a fabric screen for flotation, and a controversial 152 mm gun/launcher for firepower with the Shillelagh missiles. 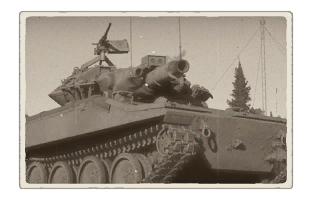 However, the design's lightweight and mobility made it favorable and so the tank was approved for Army standard in May 1966 and designated the M551 Sheridan. Between 1966 to 1970, 1,662 Sheridans were produced at a program cost of $1.3 billion. The Sheridan first saw service in June 1967 n the 1/63rd Armor Regiment at Fort Riley. The first air usage of the Sheridan came from the 1/17th Cavalry at Fort Bragg. Its first overseas deployment was to South Korea in November 1968 and Europe in January 1969. 800 Sheridans were deployed worldwide by 1971. Troubles with the 152 mm Gun/Launcher plagued the M551's early service life as attempts were made to fix the issues in the weapon's ammo propellant and ability to fire missiles. The Sheridan's tank's first combat would be seen in Vietnam under the urging of General Creighton Abrams. The tank first arrived in January 1969 modified for the environment in a configuration dubbed "Two-Box M551" with many complex mechanical instrument boxes removed (save for two), as well as the ability to fire the Shillelagh missiles disabled and the production of a fletchette ammunition for the 152 mm gun/launcher. First impressions of the Sheridan were positive due to the weapon's effectiveness in anti-infantry and bunker busting roles, as well as the mobility able to maintain speed with the M113 armoured personnel carriers. However, experience soon soured when the lack of armour became apparent compared to the M48 Pattons employed in the theater, with the M551 vulnerable to mines and the numerous hand-held anti-tank weaponry. Post-Vietnam, the M551 Sheridans underwent a product improvement program (PIP) that upgraded the design. The next combat operation would be in Operation Just Cause in Panama, featuring the first and only time tanks were parachuted into a combat zone. Inserted with the 82nd Airborne Division, the M551 proved a popular psychological weapon against the opposing forces. After Panama, the M551 were also deployed to Saudi Arabia as part of the Gulf War in both Operation Desert Shield and Desert Storm, where in the latter they fought Iraqi units equipped with T-55s and T-72s in the only time in the M551's history that the gun-launched Shillelagh missiles were used against an enemy. Back in the United States, the M551 also found use in the U.S. Army's National Training Center at the Mojave desert in California, where they are dressed up to look like Soviet vehicles to play as the "opposing forces" to train the army units on tactics in the battlefield. After the Gulf War, the Sheridan's combat career came to an end and so they remained in service at the National Training Center until 2004. The Sheridans were retired without any replacement in the airborne tank role. Though attempts had been made in the late 1990's for a replacement, the Army decided that an airborne tank was simply not worth the cost for a specialized vehicle. Skins and camouflages for the M551 from live.warthunder.com. This page was last edited on 6 March 2019, at 17:56.